The price differential of cryptocurrencies can be quite substantial across different exchanges. This, of course, provides an excellent opportunity for arbitrage traders. In the financial markets, arbitrage trading refers to simultaneously buying and selling an asset or a security on two different exchanges to generate a profit from the price differential found on set two exchanges. For example, if the price of a security asset is trading at USD 100 on exchange A and USD 99 on exchange B, a trader can buy the asset for USD 99 on exchange B and sell it for USD 100 on exchange A at the same time to generate a largely risk-free profit of USD 1. That is how arbitrage trading works. These arbitrage opportunities found on different exchanges are actually what keep the market relatively efficient. In other words, it ensures that prices are roughly the same across different exchanges for the same asset because if that is not the case arbitrage traders will come in and capitalize on this profit opportunity immediately. In the stock markets, arbitrage trading is usually conducted through high-frequency trading software that seeks out arbitrage opportunities and automatically executes trades on behalf of the investor. Hedge funds and proprietary trading companies are the most common users of these algorithmic trading strategies in the stock market. As price differential for cryptocurrencies can be quite large across exchanges, there is ample opportunity to make arbitrage trading profits in the digital asset space. 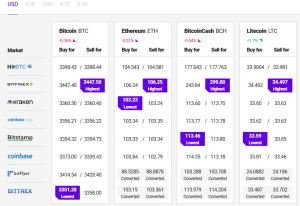 Even the most liquid crypto asset bitcoin trades at different price levels on different exchanges. February 8, UTC 08:00 AM. The widest differential can be found between geographical regions. On Zimbabwe’s leading digital currency exchange Golix, for example, bitcoin traded at a 30 to 40% premium to the international market price last year. That was because there was more demand for bitcoin in Zimbabwe due to its dire economic situation but fewer options to purchase the digital currency than in other countries. Hence, the price traded higher in the Southern African nation. Substantial price differentials can also often be witnessed when comparing Korean exchanges and U.S. exchanges. For example, during the peak of 2017, the regularly higher prices for cryptocurrencies in South Korea driven by strong local demand have led traders to dub this price differential the “kimchi premium”. Having said that, cryptocurrency price differentials also exist on exchanges based in the same jurisdiction and these can be more easily exploited than trading across borders as there is no added currency risk when cashing out into fiat currency. Cryptocurrency prices vary across exchanges due to differences in liquidity, a lack of international price referencing standards, and the inefficiency of making fund transfers between exchanges. Moreover, prices on some exchanges, e.g. Bitfinex, might be higher due to fact that it’s expensive to withdraw fiat from an exchange and this increases demand for cryptocurrency as this is a much cheaper way to move your funds from the exchange. Who are the main cryptocurrency arbitragers? Due to the large amount of capital required to profit from arbitrage trading opportunities, the two main players in the crypto asset arbitrage space are so-called “whales” and hedge funds. Whales – early adopters of cryptocurrencies who now have millions in cryptocurrencies – can place big enough trades so that it makes sense to profit from a USD 50 price differential in bitcoin. They know how to navigate exchanges and have experience in locating the necessary liquidity to successfully execute an arbitrage trading strategy in these markets. The same goes for digital currency-focused funds. Crypto hedge funds have the capital and the resources to successfully deploy an arbitrage strategy and several of the over 225 specialized funds in this field utilize this approach as part of their investment strategy. Interestingly, in January 2018, Singapore-based hedge fund Kit Trading, a unit of Vulpes Investment Management, announced that it has raised USD 10 million for a new bitcoin arbitrage fund that will specifically seek to exploit cryptocurrency price differentials across various exchanges. “When it comes to the question of whether cryptocurrencies are the future of money or a millennial tulip mania we are agnostic. What we firmly believe in is arbitrage, and arbitrage opportunities abound in this nascent asset class,” Steve Diggle, CEO and Founder of Vulpes Investment Management, said back then. However, the company has not disclosed results of its arbitrage fund. Should you adopt this trading strategy? As a small investor, it is difficult to engage in arbitrage trading in the cryptocurrency markets as you require a large amount of capital for the strategy to be profitable. Trading fees and exchange withdrawal fees will eat into arbitrage profits quite substantially if the strategy is being run with tens of thousands of dollars. For this strategy to be profitable, an investor needs a bare minimum of USD 100,000 to get started but even then the potential profits would be rather small. Hence, cryptocurrency arbitrage is really a rich man’s game. Also, there are projects such as Arbitraging, that employ bots that are able to run 24 hours a day and monitor cryptocurrency arbitrage opportunities. In light of the inefficiencies found in the crypto asset markets, cryptocurrency arbitrage looks like an absolute ‘no-brainer’ at first sight. However, this trading strategy is not without its challenges, which are mainly related to the comparatively small size of the digital asset market and the inefficiency of its infrastructure. Firstly, there is the issue of limited liquidity. To generate a profit in arbitrage trading, traders need to simultaneously buy and sell a cryptocurrency in large volumes to benefit from a relatively small price differential of only a few percent. However, despite bitcoin’s growing market capitalization and daily trading volumes, it is still a comparatively small asset class compared to the likes of stocks and bonds, which means its order books are rather light in liquidity. If you want to buy and sell BTC 20,000 to benefit from a small price differential, for example, it will be hard to find exchanges where orders of this size will be easily filled for the arbitrage trade to be profitable. Trades of this size can easily move the market. Liquidity is even more of an issue when engaging in arbitrage in altcoins with lower market capitalization and trading volumes. Secondly, there is the need to transfer funds onto or between exchanges to capitalize on the arbitrage opportunity. In some instances, this can take too long, at which point the arbitrage opportunity might already be gone. Also, cryptocurrency transaction fees need to be taken into account when sending funds around. While transaction fees are generally quite low, if you move funds constantly they do add up. Thirdly, aside from standard cryptocurrency transaction fees, trading fees also need to be taken into consideration as they directly impact your arbitrage trading profits. The major exchanges charge between 0.1% and 0.3% commission for each trade. This needs to be multiplied times two for arbitrage trades as there are always two legs to each trade. While there are a few zero-fee exchanges, the most liquid exchanges that you will need to trade on to successfully arbitrage the market all charge trading fees. Fourthly, since you have to transfer funds to and from exchanges to conduct arbitrage trading as well as transfer your funds back into your personal wallets at the end of your trading day, exchange withdrawal fees also need to be taken into consideration. Withdrawal fees are usually a small nominal amount. However, if you are transferring funds several times a day from exchange to exchange and back into your wallets, these fees will eat into your profits just like transaction fees and trading fees do. Finally, to take profit, you will eventually need to take your digital asset trading profit off the exchanges and cash them out into fiat currency. Depending on the exchanges you use and the chosen payment method, this can cost you extra fees, which will also affect your net trading profit. It is, therefore, advisable to find arbitrage opportunities that generate a trading profit of more than two percent as 0.5% can easily be eaten up in fees to make the trade happen. While arbitrage is considered to be a risk-free trading strategy, there is a risk in cryptocurrency arbitrage trading that cannot be disregarded. That is the risk of unexpected losses stemming from holding large amounts of cryptocurrency on centralized exchanges. Centralized digital asset exchanges are susceptible to operational errors as well as cybersecurity breaches, which can lead to the loss of funds for account holders. Given that cryptocurrencies are still largely unregulated in most parts of the world, there is little legal recourse for investors who lose their digital funds. Furthermore, only very few exchanges insure their clients’ funds against unexpected losses. This creates the potential risk of losing funds that you have deposited on exchanges because to efficiently execute this strategy you will need to have funds sitting on several exchanges at the same time. Obviously, once you have finished your trading for the day, you can withdraw both your digital and fiat currency. However, as mentioned above, this will incur further fees. To generate small arbitrage profits, traders are required to put a large amount of funds at risk on exchanges. Hence, the risk of losses due to holding funds on centralized exchanges need to be taken into consideration and weighed against the potential profits that this trading strategy can bring.